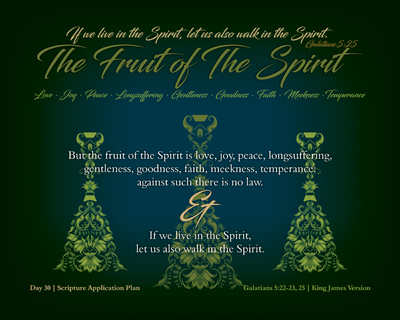 It has been a long and often winding road to get to a place where this Series could be fit together in a manner that would make it “different” from so many others that have been created on sharing The Fruit of the Spirit topic presented to us in Galatians 5:22-23 | KJV. For me at least, it is important to include a key verse for this widely known portion of Scripture to explain why we are to do so, which is found just a second verse later in Galatians 5:25 | KJV. The daily “walk” is where my concern for this Series being something more than a few verses to memorize, but rather touch and highlight how our lives should be under-girded by the Word of God in all areas. Much like Proverbs, the Wisdom and Instruction book of the Bible, this Series is presented over a month worth of days, expanding our knowledge of those nine (9) items to thirty (30) in application. Instead of being the finished product, this presentation creates a launching pad for each of our own consideration of how we live and walk in the Spirit. We each need to better understand that Fruit is shown and explained to us throughout the Bible, in places where we might not have considered before – simply because we weren’t looking at it through the lens of being such Fruit. Those are more than just nuggets of Truth, they are God’s Word written down for us to understand how to Live in the Spirit and Walk in the Spirit. Keeping that in mind and making application of it into our lives as Christians, this Series is designed in such a way that we can learn a few verses of God’s Word each and every day in the form of a concise devotional. An even better way to retain the verses to memory is to write them down each day. Consider this, on average a person will retain about 10-15% of what he or she reads, about 20-25% of what is heard, 30-35% of what is seen and heard together and a whopping 70-75% of what is said and written down. It is the reason that I read the Bible out loud and I write down those verses in my journal or for Series ideas/building. We are not given the “stats” in the Bible as to how this process works, but we are instructed to do the very thing I’ve suggested that we do ourselves in Deuteronomy 6:7-9 | KJV. The wait is finally over… The right application and research into a well-known passage has turned out something more than just consideration – it is a living challenge to “live in the Spirit” as we make the daily decision to “also walk in the Spirit”. It is my hope that each person who comes across this Series will realize that it is something more than just a print with a verse or two of Scripture placed upon a creative canvas, but rather it represents an entry door into learning what those parts are of the Fruit we each are to bear as Christians. If you will flip to the Website and go to the Series page, all 30 days are listed. It is my hope that each and every person will have the desire kindled inside of them to learn these 30 passages to more fully understand The Fruit of the Spirit as a launching board into the book that has no equal, God’s Holy Word – the Bible!